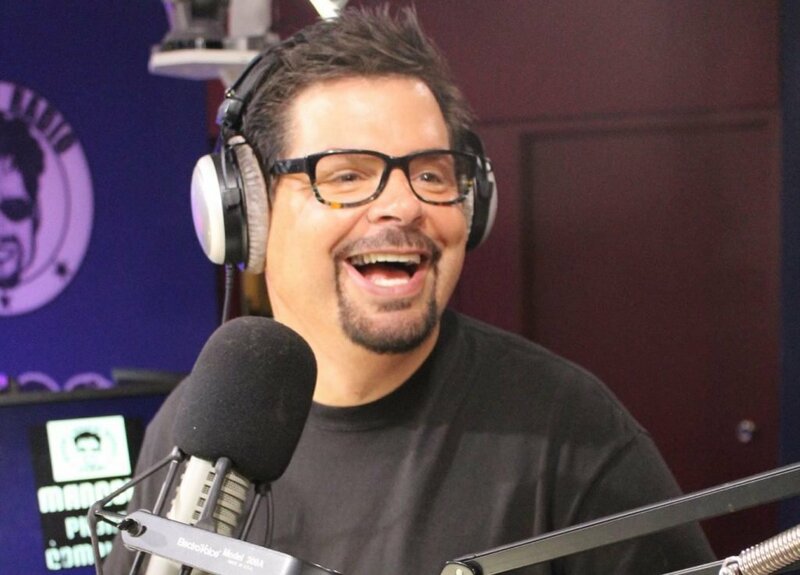 Well-known Chicago radio and TV personality, Mancow Muller, Friday urged Harvest Bible Chapel Pastor James MacDonald to “man-up” and own his sin in a very frank and personal discussion on WLS/AM890. MacDonald and Muller are friends. And there’s no doubt, MacDonald has had a big impact on Muller spiritually. Muller traveled to Israel with MacDonald and others from Harvest in December, and was baptized by MacDonald in the Jordan River. However, Muller this morning expressed disappointment and frustration with his friend in the wake of recent revelations of financial and spiritual abuse at the church. This week, Harvest elders announced that MacDonald is going on an “indefinite sabbatical” from preaching and leading in Chicago, but left open the possibility that he will still preach from the church’s new campus in Naples, Florida. Mancow said the “sabbatical” was really a vacation that MacDonald had planned for months and that elder rule at Harvest is a “giant scam.” He accused MacDonald of “playing his audience” and urged him to be honest and come clean. Let it be known you all reached out to me and I responded. I love Pastor James. That is the FIRST thing I hope everybody knows. I repeat: I love my pastor. I want the best for him and his family. I also am a guy that gives away 10% of my salary to various charities including Harvest. I think some of the questions being asked are fair otherwise why the various statements from the church? “Where’s there’s smoke…” Harvest is ONLY James MacDonald. I don’t believe it could exist without him. So I want him to be restored . I think he has done endless great things for the body of Christ. But everyone knows there is no one REALLY calling the shots but Pastor James. So when I read that his long planned vacation is suddenly being called a “sabbatical” it’s just pure nonsense. Proverbs 27:17. I believe HE would want me to say this. How about that? He has always encouraged me to tell it like it is. I’m shocked that none of my other brothers in Christ at Harvest have had the gumption to step up. But then again I’m not on the payroll. We are taught to be men of Christ and take a stand by Pastor James himself ! I want him to man up and do what HE would tell US to do. That’s all. I want him to come to HIS church and tell us the truth? What is the sin he mentions? What is he repenting from? Are we sheeple or men of Christ as he himself instructs? So much has been mischaracterized about our church and our pastor. I just pray that people don’t lose sight of how much great this man has done for the kingdom. I’ve witnessed him saving marriages and keeping people out of hell and I could go on and on… What a gift! Is there any other preacher on the planet that can deliver a message like Pastor James McDonald? I don’t think so! He needs to be restored in my opinion. But not through the spin and malarkey that’s being floated by “the church” that’s so obvious it’s insulting. By breaking ranks I realize that this will be of great cost to my family. I have young daughters that love and admire Pastor James . He’s family! I have a Catholic wife that has been reluctant to pursue the evangelical/ born-again experience with me. This is just so devastating to so many. I have been attacked (as has pastor James) for our friendship by these modern Pharisees that seem to have all the answers but yet have never run a church before like he has. And who exactly did Jesus hang out with? Perfect Christians? Nope taxpayers and sailors etc. Somehow these folks characterize me as a man not worthy to love Jesus or be loved. Sickening. I hope Pastor James doesn’t regret our friendship. I’m heartsick over this situation. Mancow, I applaud your courage and will be praying for you. I highly recommend checking out the APP *** RefNet.fm *** 24 hour Christian radio. Once we have our theology and doctrines correct, our lives will reflect it. Forgive me for being so cynical, but I’ve read the transcript and listened to the actual dialogue. Something seems very “scripted” here. Most especially when you listen too it. It’s almost, nay, it’s *very* much as if the sally-girl spineless sychophant “elders” wrote this whole script for Mancow. You sound like one very angry & resentful man. I’m okay with you being cynical, because I am too. We’ve been burned by enough authority figures, right? But based on what you wrote, I don’t believe that you truly listened to the audio transcript in its entirety — if at all. Because if you did, you’d hear Mr. Muller call the Harvest elders “a**-kissers” (~3:30 minute mark). So tell us again, how you strongly believe that the elders wrote this “script” for Mancow ? Looks like you just wanted to have a chance to slam pastor JMac in your own personal way. And I challenge you to call 6’5″ JMac a “fat, ignorant slob” to his face. It’s easy to hide behind a keyboard and hop on the hate bandwagon, isn’t it ? I understand being hurt & betrayed by Harvest’s leadership. But this sounds personal. You even take a mean jab at Catholic priests. Really ??? Especially when the truth is that the *vast* majority of those working “in the trenches” were — and are — God-fearing and incredibly hard-working, self-sacrificing men. I don’t know for sure whether it is scripted or not, but I applaud the courage of coming forward. I highly recommend checking out the APP ***RefNet.fm*** 24 hour Christian radio. I just know, once we have our theology and doctrines correct, our lives will reflect it. Well said! This whole fake repentance while taking a vacation to one of the wealthiest cities in the country with one of his best friends which oh by the way was planned last year is disgusting and furthermore the fact that this repentant “non-bully” Pastor then fires the Pastor of Harvest Naples for not yielding to him. Gross. How does anyone attend and listen to JM. People need to run not walk out of these false churches. Go to Twitter and search for posts dorected to @jamesmacdonald if you need more proof or “unscripted” details about this mess. 1. A celebrity is MacDonald’s friend. How about that? How many “Joe Sixpack’s” who attend Harvest, perhaps for a couple of decades, can say MacDonald is a personal friend? Very, very few. But our celebrity is. 2. This sabbatical thing, in general, is so pathetically comical, because it seems to be ONLY a Christian thing. Can you imagine “Joe Sixpack” declaring to his boss that he is going on an eight week sabbatical. The boss would probably tell him to make it eight decades, not weeks. 3. Hey, a bonus point!! MacDonald loves golf. Just a fact; it’s really hard to play golf in the Chicago area in winter. Spot on Marc. They are the absolute poster-child of fake Christianity. Please people; awake! Why do we as Christians continue to follow individuals who disparage/dishonor the message of Christ? Think; Pastor Secrest starts a local church, seems to follow Christ in its expansion; and ends up having it stolen by a wolf. People of Harvest-Naples, take a stand and choose ye this day! I’m going to comment in a different vein—an earlier commenter said that McDonald needs to watch out for his pride like Nebuchadnezzar. Ole King there didn’t listen to the LORD and he spent time eating grass like a cow till he humbled himself and then he acted like a man again. And we have “Mancow” Mueller calling Pastor James out…hmm. Also, the cohost asks if Pastor James is afraid of something. I don’t know how much of this blogs readers are into the Enneagram here—it is a typology system that splits people into 9 numerical types—and each type is avoiding a core fear. James strikes me as a type 8, The Challenger. 8’s are big and intense. They can be magnanimous leaders (at their best) but at avg/worst they are egotistical and proud, and can do great damage if they lust for power and pride. Their core fear is of being harmed or controlled by others. I think Pastor James’ fear is maybe rooted there. 8’s who don’t choose to face their weaknesses/vulnerabilities get egotistical and can minimize their wrongs all day. But the path to growth is for the 8 to face those vulnerabilities. But you don’t need the Enneagram to show how fear hurts believers. He might “be aware” like Mancow says, but seems he’s choosing to let fear and Big pride blind him. Let us pray Pastor James humble himself and repent! And surrender what he must. The Fathers’ heart for Pastor James is repentance. Let us pray it comes from His Mercy and not His Judgement. The Lord will reveal the True Church that wants to follow Him and nothing else. Does it take a “Mancow” to tell a Pastor with pride seeming like Nebuchadnezzar’s to repent? The king who lived like a cow, eating grass and his head getting wet with the dew of heaven. Until he repented and praised the Lord Most High above all others. Let us pray that Pastor James will humble himself and repent, and surrender all he needs to to the Lord…while there is time Mercy, before Judgement. Hearing a lot of calls for transparency by HBC (aka Hypocritical Baloney Corporation). But we already have enough information, thanks in large part to Julie Roys. HBC has had plenty of chances to come clean and mend their ways over many years. Instead of doing so, they have repeatedly chosen to double down on their folly. Now it’s time to clean house. MacDonald, his family, those marionettes that HBC calls elders, and the senior pastors at all the HBC campuses (collectively known as “Pastor MacCheese and the Fry Guys”) have lost all credibility and have forfeited their right to call themselves leaders of anything. The decent thing for all of them to do is resign and find other things to do with their lives, preferably in secular positions where they can’t do as much damage to Christianity. Someone else, either on this blog or another, made a really good point: spiritually mature Christians don’t tolerate this kind of behavior. What does that say about the attendees who remain loyal to HBC, despite all the information now out there? I am baffled by people’s refusal to even read the articles. God hasn’t opened their eyes yet. If the church is to stand, it will need people to pick up the pieces. Best quote I heard yesterday: it’s hard to see the picture when you’re still in the frame. Many of these people moved to ELGIN area when the campus opened, send their kids to HCA, maybe even work for HBC, and all their friends are there. They are in small groups, growing due to this ministry or another ministry. I can see how hard it is to think about leaving but at least start asking questions. Mancow for the senior pastor of HBC -Humbug Beggeting Charlatans. He said it right, MacDonald is a scammer presiding over giant scam. The use of the phrase “man up” is problematic. It shames women. Here is a quote from the Bustle web site. “He’s good onstage……” That line says it all. As if that was what being a shepherd is all about.